The fact of the Lost Ark of the Covenant is one of the grant historical mysteries of all time. To believers, the Ark is the legendary vesel holding the stone tablets of the Ten Commandments. The Bible contains hundreds of references to the Ark's power to level mountains, destroy armies, and lay waste to cities. The Ark itself, however, mysteriously disappears from recorded history sometime after the building of the Temple of Solomon. After ten years of searching through the dusty archives of Europe and the Middle East, as well as braving the real-life dangers of a bloody civil war in Ethiopia, Graham Hancock has succeeded where scores of others have failed. This intrepid journalist has tracked down the true story behind the myths and legends -- revealing where the Ark is today, how it got there, and why it remains hidden. 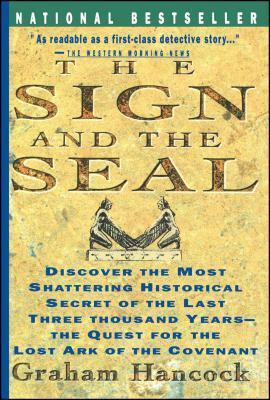 Part fascinating scholarship and part entertaining adventure yarn, tying together some of the most intriguing tales of all time -- from the Knights Templar and Prester John to Parsival and the Holy Grail -- this book will appeal to anyone fascinated by the revelation of hidden truths, the discovery of secret mysteries. Graham Hancock was the East Africa correspondent for The Economist and is the author of several previous books on Africa and the Third World. He lives in Devonshire, England. The Seattle Times Anyone who likes a great intellectual detective yarn will plunge into The Sign and the Seal and not come up until the end.